Review posted December 2, 2018. Templar Books (Candlewick Press), 2015. 36 pages. This is a sweet grandson-grandfather story about snow and about getting ready and about waiting. There’s a dose of imagination thrown in as well – or maybe just good plain fun. 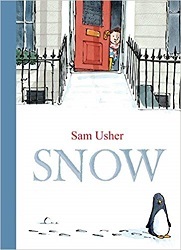 The book begins with a boy waking up to snow! He can’t wait to get to the park. He gets ready quickly – but Granddad is still getting ready. So they’re not the first ones. Granddad reminds the boy about a few things – his scarf, then his hat. But more people are ahead of them, getting to the park. The snow in front of their house is no longer untrampled. But we were! I told him all the cats and dogs were out there. Granddad laughed and said the whole zoo was probably out there. And then I saw something. . . . I like the way, when they finally get to the park, there really are a bunch of zoo animals having a grand snowball fight with the kids. They all have a wonderful time, and the boy and his granddad agree that some things are worth waiting for. I like the nice touch that the boys stuffed toys in the house before they leave are the same animals as we see later in the snow. So was it all his imagination? Whatever it was, it’s lots of fun.